Eve is a Physiotherapist specialising in the management of chronic musculoskeletal pain. 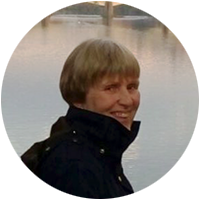 She has worked in Primary Care for over 25 years specialising in pain management since 2004 and appointed Consultant Physiotherapist in 2009. She worked as part of a community based multidisciplinary team delivering an assessment, treatment and self-management service for patients with chronic musculoskeletal pain to the ethnically and economically diverse population of East and North Birmingham. Eve left full time employment in the NHS in 2013 to focus on skills training and development in the management of long-term pain. With medical and psychology colleagues she runs courses for health professionals to enable them to train and support people with chronic pain and other long-term health conditions to confidently self manage their problem and improve their quality of life. Eve continues to work as a clinical specialist with people with long-term pain both privately and in the NHS. She contributed to the DWP expert review panels on the work capability assessment and from July 2013 to March 2015 worked part time at the Chartered Society of Physiotherapy as a Professional Adviser. Eve was the Physiotherapy representative on the British Pain Society Pain Management Programme (PMP) Special Interest group from 2010-2011 and is a member of the BPS working group reviewing the guidelines for PMP for Adults.